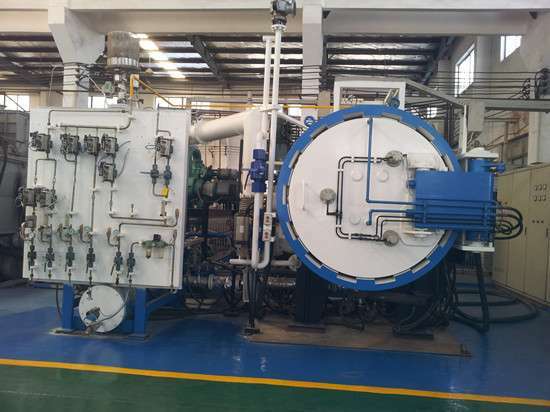 Vacuum pressurized sintering furnace is mainly used for sintering hard alloy, structural ceramic materials under high pressure gas. It consists of pressure vessel, heating system, temperature measuring system, vacuum system, pressure system, automatic control system, hydraulic system, locking system, water cooling system and material lifting platform. 1., with high automation, it can start healthily, and has a high degree of automation. It has the display of furnace working state, real-time display of equipment operation, programmable controller and man-machine interface control system. 2. high security, PLC security chain, with over temperature sensor, closed uniform, high pressure, high pressure furnace, water flow, water temperature is too high, sound and light alarm. 3., by revising the bright and true temperature conversion model, it can realize paperless recording of historical data and temperature curves, and temperature deviation correction function, which can manage multiple devices and remote fault diagnosis. 4. control the convection channel effectively, and keep the uniform temperature and pressure balance. 5. bottom type, loading and unloading, convenient.